Psycho now has new features both visually and at the level of history, as well as new scares and "different" endings. This is my Final Degree Project, Psycho, a game of exploration and tension, in which all 3D models have been created and textured by me. You appear in an abandoned house, but with signs that not long ago people lived there. There's not much light, so you pull out the phone and try to know where you are and how to get out of there. You notice something that stalks you, but you do not know very well what it is. You investigate and you begin to recognize the people who lived there. Now you just have to get to the exit. Some bugs have been fixed with the sound. Interactions with doors and switches have been improved. Increased the sensitivity of the camera with mouse. Psycho cuenta ahora con novedades tanto a nivel visual como a nivel de historia, así como nuevos sustos y "diferentes" finales. 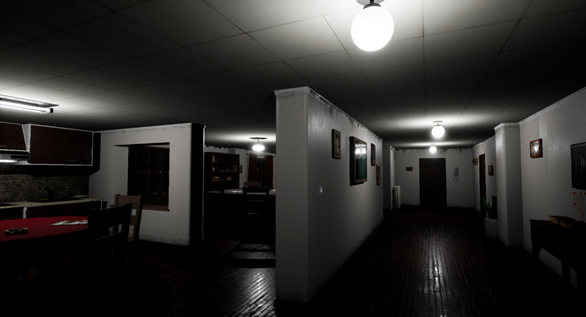 Este es mi Proyecto final de grado, Psycho, un juego de exploración y tensión, en el que todos los modelos 3D han sido creados y texturizados por mí. Apareces en una casa abandonada, pero con señales de que no hace mucho gente vivía allí. No hay mucha luz, por lo que sacas el teléfono e intentas saber dónde estás y cómo salir de allí. Observas algo que te acecha, pero no sabes muy bien de qué se trata. Investigas y comienzas a reconocer a las personas que vivieron allí. Ahora solo tienes que llegar a la salida. Se han corregido algunos bugs con el sonido. Se han mejorado las interacciones con las puertas e interruptores. Aumentada la sensibilidad de la cámara con ratón. 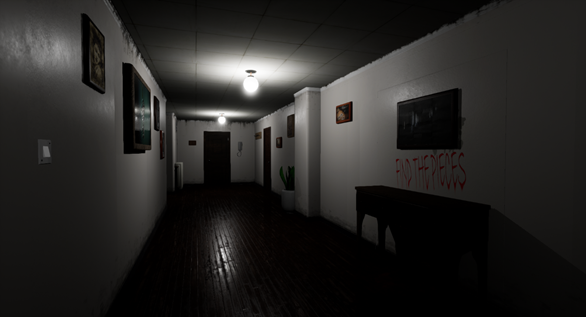 Played this for a free random indie horror, and I have a few things to address. (Please note that all my reviews on games come across as harsh, so my apologies in advance) For starters the camera movement is a crime against gaming, the mouse smoothing, and aim acceleration on it feels like i fighting the camera most of the game, i would MUCH prefer a raw input over that anyday. 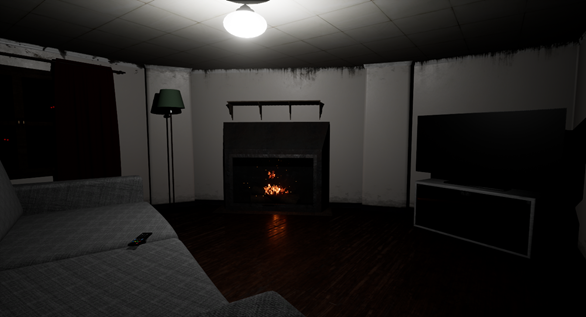 The game was a little creepy with some loud noises and the occasional brat that ran past the doorway, but nothing really gripping or particularly scary, just (Again) loud noises and jumpscares. The flashlight is pretty bad and feels like it going dead on it's last bit of battery juice the whole game. Why such a unrealistically dim flashlight? Story is pretty cliche, Wake up in and unknown locations and ya gotta find X number of items to get out. I couldn't sprint or jump, which was annoying as i feel ALL horror games should have those basic features, the graphics were pretty good actually, and the atmosphere (While lacking) wasn't too bad. Now don't take all these things i'm saying as the game being bad, because it's not, but it definitely need some changes and updates to be a world better. Maybe add some more story elements and more gripping atmosphere, scares (Not jumpscares) and gameplay? It feels like a short walking sim experience with a puzzle piece hunt and like 3 jumpscares. However all this being said, i can see a TON of potential here and would love to see another project with all this feedback taken into account or just an update to this game and more content. I give a more in-depth review in my playthrough below. I think this is more a demo of my 3d model skills, in fact it was my final project for my career. It began as a 3d model project, and in the end i made a game. I made all alone in 3 months (the only developer, artist, marketing guy, etc), so i've learned a lot of Unreal engine and the pipeline of 3d art for games. The story changed a lot during the making process and there was more puzzles to resolve, like a combination or something like that, but i hadn't enough time to do it. But i'm happy about the final result, and furthermore, you played the updated version which includes the story with a little explanation xD. Well, in any case, i appreciate so much you feedback, and in a future maybe i'll make a second part explaining more and adding some new features. Buen juego, cortito pero intenso, me lo he pasado muy bien jugándolo. Good game, short but intense. I enjoyed playing it. I really enjoyed this horror game! Definitely creepy and the atmosphere gave me the shivers! I did run into an error whenever I answered the phone but was able to finish the game by ignoring it. Thanks for playing my game :), the volume seems a bit low, but i like your video a lot. Very funny see you playing :D ty for playing my game. Thank you for playing my game :D, it was funny see your reactions. Gave it a go...SKIP TO 10:29! What does psycho want to do? Or do you want to die here? That's it. Thank you for playing my game :D Its my final degree project, and its all made by hand. It was funny see you playing :).